Scottish songstress Amy Macdonald is currently in the middle of her latest tour, heading out across the UK to promote her recently-released album, Under Stars. As this is the singer-songwriter’s fourth studio album, she now has a healthy back catalogue to draw on and is able to alternate between rousing fan favourites and showcasing her new material. Under Stars builds on the classic Amy Macdonald sound, now virtually perfected after four albums and ten years in the limelight. It may seem as though Amy has come a long way since the release of her debut album, This is the Life, in 2007, but the Scot is one of those precious few stars who hasn’t lost sight of her beginnings since she started off along the long road to fame. Confessing her nerves to the audience and begging them to “be kind” to her at points during the set, Amy still seems to be living one of those ‘pinch me’ moments. Admitting that she was incredibly nervous about performing without the safety net of her band behind her, it is this kind of realness and air of vulnerability that lends a particularly endearing quality to both the performance and Amy as a person. Performing a good mix of new tracks and old favourites, the set lasted almost 2 hours – 2 hours of non-stop entertainment on a Saturday night in the city. Her band were talented and enthusiastic, but it was Amy’s incredible voice that really stole the show. Performing a stripped-back ballad version of hit single ‘4th of July’, the power and emotion in her voice were clear to see. It wasn’t hard to understand why the audience went silent whenever Amy opened her mouth; everyone was utterly captivated by the palpable atmosphere in the room. Supported by singer-songwriter Newton Faulkner, the show was a massive success from start to finish. Newton’s unique blend of folk-inspired pop-rock was the perfect opening act for the evening to come – and with a set lasting approximately 45 minutes, there was plenty of time to get the crowd warmed up ready for the main event. Newton played a strong combination of tracks, comprising of well-known singles like ‘Dream Catch Me’ right through to unfinished half songs from his upcoming sixth album. Performing entirely solo, with only the accompaniment of a trusty guitar, a kick-drum and a loop pedal, it’s clear to see his influence in other acts like Ben Howard and fellow redhead Ed Sheeran. Ending the set with a truly remarkable one-man rendition of ‘Bohemian Rhapsody’, Newton very nearly managed to steal the show. The crowd present at Nottingham’s Royal Concert Hall on Saturday night were treated to a memorable night of music, thanks to two extremely talented artists. It’s rare to find musicians who refuse to let their rise to stardom change who they are, but both Newton Faulkner and Amy Macdonald have managed to do just that, sticking to their roots regardless of the trappings of fame. In a cut-throat industry like the music business, it’s more Amy Macdonald’s and Newton Faulkner’s that we need. 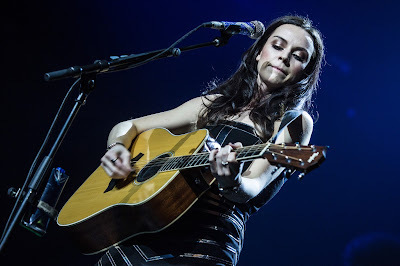 Are you a fan of Amy Macdonald? Let me know in the comments below!